RICHMOND, Va. — Members of the Virginia Defense Force took part in the “Perfect Storm” statewide amateur radio emergency communications exercise Jan. 19, 2019, in Richmond and Lynchburg, Virginia, and the VDF was among the nearly 80 amateur operators and agencies registered for this annual event. 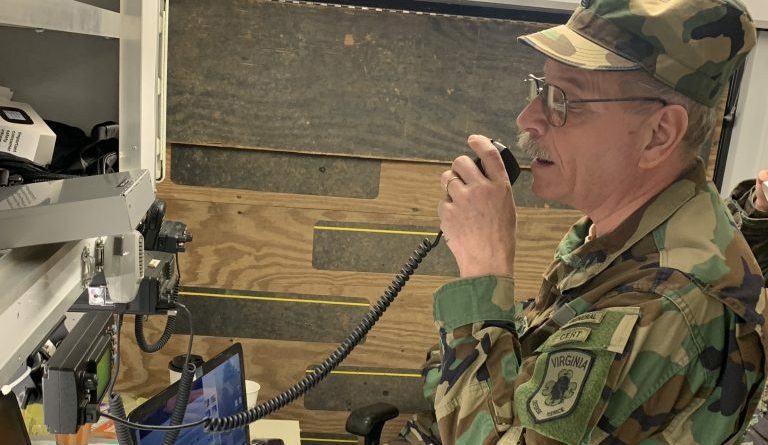 In Richmond, VDF personnel trained on amateur radio systems and built partnerships with amateur radio operators who support the Virginia Department of Emergency Management at the Virginia Emergency Operations Center. In Lynchburg, VDF members used the equipment in their mobile communications platform trailer to make contact the operators across the state. Amateur radio can be an invaluable emergency communications resource in severe weather situations when tradition systems are unavailable. Bruce explained. The exercise provided an opportunity for the VDF to continue to build on the existing partnership with VDEM and expand their relationships with amateur radio organizations, said Maj. (Va.) Shawn P. Landis, a Communications Operations Officer for the VDF and was the officer in charge of the VDF personnel working in Richmond during the exercise. 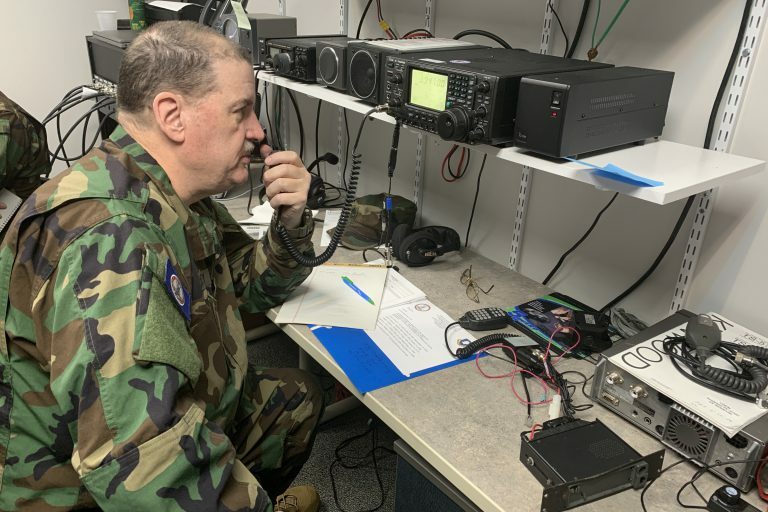 Landis explained that each time the VDF is able to conduct exercises with amateur radio organizations, they are able to improve their ability to communicate across long distances. He added that the exercises provide opportunities for experimentation with different antenna configurations, different modes operation, and to learn from amateur radio operators with many years of experience. For this exercise, several modes of operation were available for use, but HF and Telnet Winlink (digital message transmission), and HF 40 and 80 meters voice communications were used by the operators at VDEM. “These exercises provide an assessment of capabilities in terms of training and equipment, and we get better each time we come out,” he said. According to the National Association of Amateur Radio web site, there are three types of license classes for amateur radio operations: Technician, General and Amateur Extra. The Technician class license is the entry-level license of choice for most new radio operators, the General class license grants some operating privileges on all amateur radio bands and all operating modes, and the Amateur Extra class license conveys all available U.S. Amateur Radio operating privileges on all bands and all modes. The ARRL site explains that amateur radio, also known as ham radio, can be used to talk across town, around the world, or even into space, all without the Internet or cell phones and can “be a lifeline during times of need.” Amateur radio operates on designated “radio bands” as authorized by the FCC as a companion to other bands of radio spectrum allocated for government, military and commercial radio uses employed by aircraft, ship, fire and police communications. 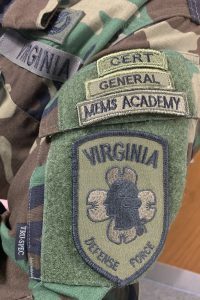 Landis holds the Amateur General license, and the VDF currently has about 10 percent of its members holding one of the three licenses. The highest percentage of members with licenses are assigned to the Communications Battalion, but the VDF is encouraging all its members to pursue this achievement. Members who have a license can were a tab on their uniform indicating the type of amateur license they hold. Membership in the VDF helps license holders to improve their skills and help them prepare for the higher level license. To earn the Technician license requires passing one examination totaling 35 questions on radio theory, regulations and operating practices. After earning the Technician license, an operator can earn the General class license rafter passing passing a 35 question examination. Earning the Amateur Extra license requires passing a thorough 50 question examination. The VDF MCP is a 7 1/2 feet by 16 feet trailer equipped with multiple radio systems for voice and data communications, and it also features a map board and work space so it can function as a mobile command post. Using an MCP, members of the VDF are able to communicate across a variety of radio spectrums with emergency response and public safety organizations as well as amateur radio operators.